Well, here it is mid-December and as you might expect many people in the US are focused on the transition from their Thanksgiving celebration to preparations for Christmas or Hanukkah. But that is not all that is on most people’s minds. 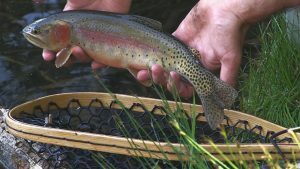 For fly fishers there are spawning runs in the Pacific NW and Midwest; often trailed by large rainbows and/or browns eager to fatten up on an egg rich diet. Tailwaters in some areas are open year round as are some fisheries in the south. A fortunate few are able to hop a plane for adventures in the southern hemisphere, where it is currently summer, or saltwater adventures. While those are all localized or limited opportunities there is fly fishing and tying excitement available almost everywhere in the form of fly fishing shows or expos and fly shop demos and events. These shows and events give us an opportunity to kick the tires on the newest rods, reels, waders and other equipment. We get to see the latest material discoveries, patterns and tying techniques from the wizards at the vise. And maybe most important, at least for some of us, there is the opportunity to spend some time with other fly fishers, swap stories and stay in contact with the things we love about fly fishing. Beginning immediately after the first of the year my own schedule will begin in earnest; and I hope you’ll visit. Besides old favorites in Colorado, Idaho Falls ID, Lynnwood WA, Pleasanton CA and Warren MI I’ve added a trip to Calgary for the Western Canadian Fly Fishing Expo. But I’ve already found a couple reasons to get in the fishing mood.